The release of “Worldwide Choppers” brought about an unprecedented amount of covers from both Tech N9ne fans and artists. Everyone wanted to lay down the best cover to this tongue twisting anthem from All 6’s And 7’s. SimplySpoons joined in on the “Worldwide Choppers” craze with a cover of his own that adds a little fun to the otherwise serious track. 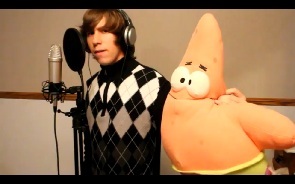 Carrying a Patrick doll from SpongeBob SquarePants, he puts his game face on and tears into the adrenaline pumping collaboration track, as he gives an impressive showing over verses from Tech N9ne, Yelawolf, Twista, and Busta Rhymes. He manages to execute near perfect enunciation, which is easier said than done when covering “Worldwide Choppers”. SimplySpoons proves that you can still be a chopper and have a little bit of fun.